VietNamNet Bridge – Many schools in HCM City, especially schools operating under the so-called advanced model, have proposed using international curricula. Headmaster of Le Quy Don High School in district 3, at a meeting held on the occasion of Vietnam Teacher’s Day on November 20, proposed using international curriculum along with the curriculum set by the Ministry of Education and Training (MOET). According to Thach, Le Quy Don loses tens of students every year because the students leave to study abroad. In general, students leave after they finish two years of studying (10th and 11th grades). 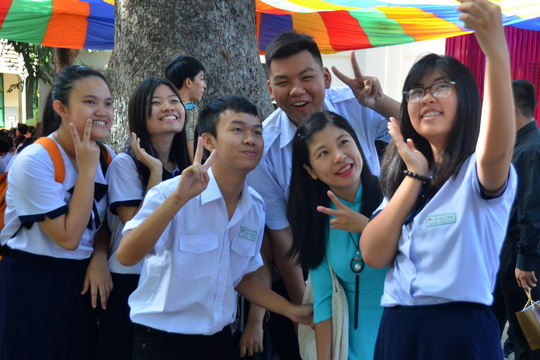 However, as the Vietnamese curriculum is not recognized overseas, students have to repeat some classes. If both curricula are used, they will receive both Vietnamese and international diplomas. If students go abroad, they will not have to waste time to repeat classes because the diplomas are recognized internationally. Reports from schools in HCM City show that the number of high school students leaving to study abroad is high. Headmaster of Nguyen Du High School in district 10 Huynh Thanh Phu also said the school ‘loses’ 30-40 students every year. There are three schools operating under the mode of advanced school in HCM City, including Nguyen Du in district 10, Nguyen Hien in district 11 and Le Quy Don in district 3. Of these schools, Le Quy Don is one of the most prestigious schools that admits only students who get very high scores at the entrance exam. Nguyen Du also set high required exam scores last year. The scores required by Nguyen Hien have dropped dramatically. Nguyen Van Ngai, former deputy director of the HCM City Education Department, believes that advanced school is a good model which helps allocate resources in an effective way. However, he said, it is necessary to review the development of the model and what advanced schools need. “As far as I know, the major differences between normal and advanced schools are in the numbers of students in every class and facilities. The education quality and curricula still rely on teachers and students,” he said. Commenting about the proposal on foreign curricula, Do Minh Hoang, chief secretariat of the HCM City Education Department, said the department cannot make a decision on the issue. However, he thinks it is not feasible. Meanwhile, some education experts, recalling the failure of the VNEN program, said MOET should think carefully about importing programs.